Genesis Town Planning were instructed to prepare and submit an application for a ‘Theatre On The Fly’ – a temporary theatre space commissioned by Chichester Festival Theatre as part of its 50th Anniversary celebrations. The theatre is a miniature playhouse seating approximately 180 people located immediately adjacent to the existing Grade II listed theatre. 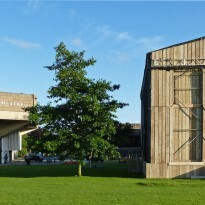 Temporary theatre structures go right to the heart of Chichester’s history; the Festival Theatre in Ontario which inspired Leslie Evershed-Martin to build our own was initially a giant tented canopy, a legacy continued in the architecture of Chichester Festival Theatre with its unique suspended roof. Similarly the Minerva Theatre began life as the Tent Theatre, which appeared every summer from 1983-1988 alongside the main house to offer an excitingly improvised venue for anything from new plays to musical revue, cabaret and comedy, but which disappeared once the new studio theatre was opened in 1989. It was a venue much loved by the community, offering a spontaneous, off the cuff theatre experience in which the spirit of local and professional volunteerism, passion and innovation prevailed and many up and coming practitioners and artists were given a chance to flourish. It is this chapter of Chichester’s history that the Theatre on the Fly sought to revive. 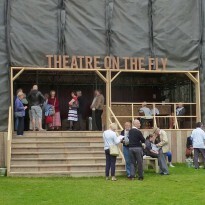 Inspired by these fleet-footed Tent productions, Theatre On The Fly brought the concept of a temporary theatre back to Chichester as a symbol of its origins, a site for its celebrations, and a test bed for its young directors. 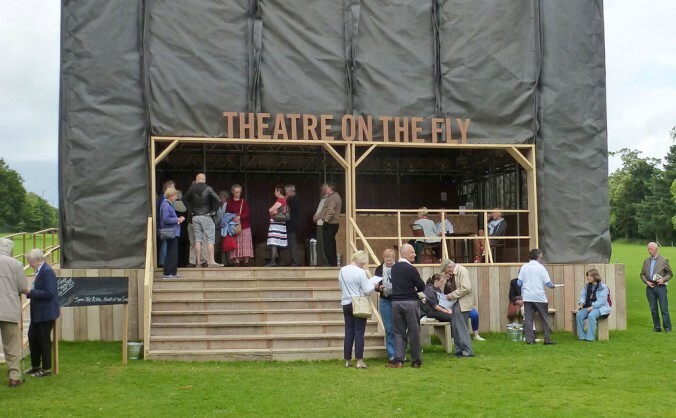 Theatre On The Fly was conceived by Chichester Festival Theatre as an opportunity to express the extraordinary spirit and strength of support for the Theatre, both across the city and throughout the rest of the UK. The existing Festival Theatre was built on public subscription, which, as well as being an expedient way to raise funds during difficult economic times, also fostered a sense of shared ownership and acted as a testament to the importance of the theatre to the wider community.